My name is Doug Haberstroh, and I'm here to tell the story of my wife Keri. We had only been married 9 months before Keri was diagnosed with breast cancer. She was 25 years old. 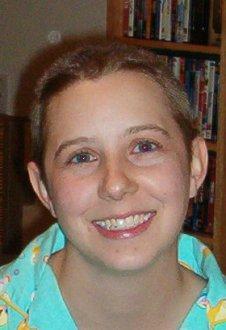 Keri was shocked by the diagnosis but determined to fight. She faced every challenge with a smile and touched everyone with her courage. This is her story from start to finish. In her latest set of emails, Keri bravely recounts shaving her head and her body's response to the second round of chemo. Another chemo session down. Only 4 more to go. My next one is coming up this next week. It's funny how when I'm there to get the medicine it seems like a long time before I'll be back to get the next treatment, but then I have so many other doctor's appointments for check-ups throughout the next week and a half that before I know it it's time for the next treatment. My dad was here for this past one. It was good to see him and nice to have someone with me again. I am happy to report that there was no panic attack this time. Though I did have some pills to help me with that. Also, I think it just helps knowing what it all involves. I'm not so scared of it anymore. It's just like getting IV's with medicine in them. The one I get on Thursday's is red so that one is actually kind of cool to watch and see as the color gets closer to my port. So I guess there are two major events this time to report on. One being that my hair started falling out a couple of days before my dad got here. It was actually a very traumatic experience. I waited as long as I could before cutting it. But as it was starting to be a nightly routine of brushing out hair and balling it up to the size of a golf ball or sometimes bigger, it began to be a bit depressing. It didn't hurt at all, and I really didn't feel much. It was sort of like brushing a dog when they shed. It just came out. Anyway, I finally conceded to having Doug cut my hair and we got out the clippers. We buzzed it sort of like a boy would have it buzzed in the summertime. I'm actually quite proud of how I handled it. I only cried a little before we got started. I even consented to having my dad video tape the whole event. It's still sad to think about, and it's hard sometimes when I look in the mirror to see myself losing my hair. It's still falling out, only now it's not as big of a mess because it's shorter. I sleep with a towel on my pillow to catch anything that falls in the middle of the night. Eventually it will all be gone and to be honest right now it's pretty pathetic looking. It's thinned out quite a bit since it started and I know there are area's already that have balded. The ladies that I've talked to though have said that it grows back quickly after you finish chemo so my hope is that by Christmas I am at least looking like I have a stylish short hair cut. 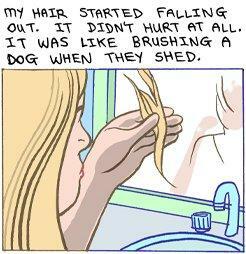 Episode 2: See the full breast cancer comic strip. The other major event is that I got to experience some different side effects with this treatment. The change in my tastes of food and drink was a little more drastic this time. It caused me to not feel like drinking much water or anything for that matter. Sadly though my body needed the fluid more than I realized and I experienced a small bout of dehydration last week. Luckily I felt the symptoms early enough to be able to make it to the doctor's office and get checked out there instead of having to go to the hospital. I ended up at my oncologist's office and they helped me out by tapping into my port and dripping in some fluid while I napped for a couple of hours. It was a great help and it kept me out of the hospital. The nurses told me that dehydration is one of the easiest ways to end up in the hospital and that I really needed to avoid doing that. So I am watching myself and constantly have something to drink at hand. The nurse gave me some suggestions on things that I can have that make it easier to get the fluids like popsicles or Jello. These are things I can have that count as a glass towards the 8 that I'm supposed to have a day. I haven't made it to having all 8 yet, but 6 has been a good number for me and I'm feeling much better. It was a scare to feel that tired and sick. It wasn't any fun and now I know what it is and how to avoid it. I'm sure that throughout the next four sessions that I have there will always be something different that I experience and each one will be a lesson learned. Actually this whole thing is an experience that a lot of lessons are being learned from. It has completely changed my outlook on a lot of things, and I know it has changed Doug's outlook on a lot of things. When this kind of a situation arises it's interesting how some of those "things" that you thought were so important are now just trivial in comparison. I wish there was a way that I could completely explain to all of you what my mind is going through right now. Unfortunately sometimes I can't even figure out what is going on in my mind. On a happier note...my sister is graduating from high school for those of you who don't know and we are planning to travel to Tulsa for a few days in June. For now we have the arrangements to go and the plane tickets reserved. Of course if something happens last minute and I'm too sick to go we can always cancel the trip, but for now we are both looking forward to the mini-vacation. I'm a little nervous about it, but have been assured by the doctor, nurses, and other chemo patients I've talked to that everything will be fine and it will be good for me to make the trip. Well, to close I am up for another treatment this coming Thursday and Friday. Doug's mom will be arriving Wednesday to be here for this treatment. It is nice not only for me, but also for Doug to have some company while I get my medicine, especially if I end up sleeping. I'll be halfway done after this one and that's a nice way to look at it. Thank you again to everyone for all the thoughts and prayers. They really do help me out especially when I'm having a down day. I feel very blessed to have so many people that care. There is no way for me to fully express my thanks to all of you. I hope that everyone is doing well. Have a great week and I'll be updating again soon. Doug Haberstroh wrote about breast cancer for HealthCentral. Doug produced a reality-based comic strip chronicling his life with his wife, Keri, who was only 25 when she was first diagnosed with invasive/infiltrating ductal carcinoma. Keri passed away in 2006.